Breakfast Cookies - Oats, Flax, Banana Chips, Chocolate! 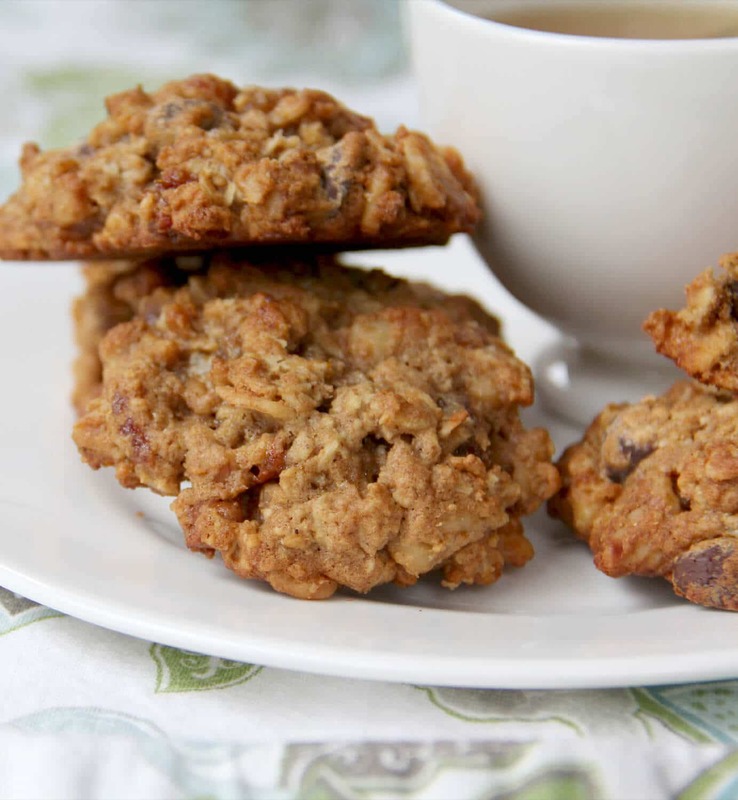 Hearty, healthy breakfast cookies made with whole wheat flour and filled with dates, walnuts, oats, and chocolate–nutritious with a touch of sweetness. When you’re a busy, working parent or a stay-at-home parent with kids and you’re trying to get everyone fed and off to school, breakfast can be challenging. It’s easy to put instant oatmeal in the microwave, but it’s just as easy to keep some healthier steel-cut oatmeal pre-made in the freezer and pop that in the microwave. Grab and go recipes are great also. 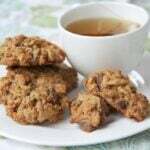 I made these breakfast cookies a couple of weeks ago and David and I loved them. I didn’t so much eat them for breakfast but enjoyed one in the afternoon with a cup of green tea. See…we’re not eating things like chocolate chip cookies in a mug all the time! Another make-ahead breakfast favorite: Diner style malted buttermilk waffles! I think these breakfast cookies, along with some milk or orange juice, would be an excellent way to start the day for young kids. They’re not too sweet, so you don’t get a sugar high, and they have enough fiber and nutrition to serve as good brain food. And they’re super easy to make! Just combine the oats, whole wheat flour, baking powder and soda in one bowl. Then mix the butter, sugar, flaxseed, salt, and cinnamon with a stand mixer until creamy, add the egg and yogurt, then the oat flour mixture, then just stir in the dates, banana chips, chocolate chips and walnuts. There’s no rolling or chilling this dough, although you certainly could if you want to make it ahead of time. You mound the dough on baking sheets and bake it right away. I’ve also frozen these cookies after baking and they keep well in the freezer. Perfect to pull out on a busy morning! What are your favorite quick and easy breakfast foods? 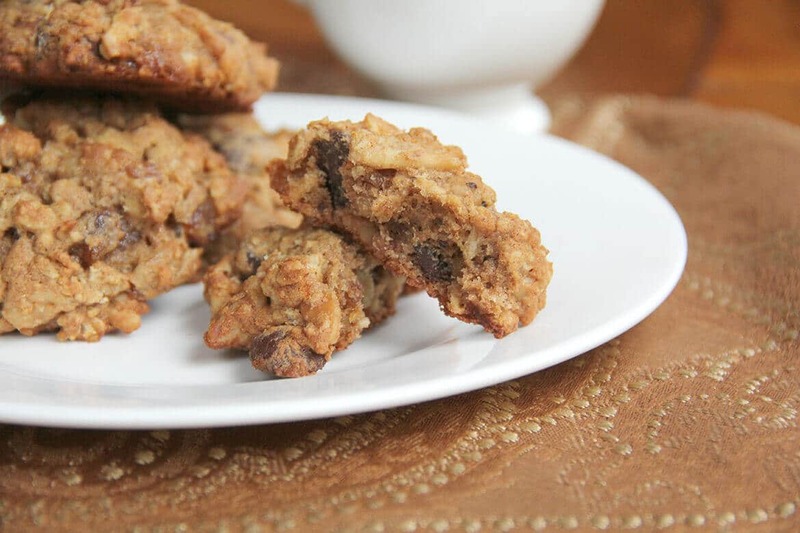 A hearty, healthy breakfast cookie made with whole wheat flour and filled with dates, walnuts, oats, and bittersweet chocolate. Preheat oven to 375. Line a baking sheet with parchment paper and toast walnuts until golden, about 8 minutes. Set aside. Line two baking sheets (can use the same one as the walnuts) with parchment paper. In a medium bowl, combine oats, flour, baking powder, and baking soda. In a large bowl or a stand mixer bowl, beat butter, sugar, flaxseed, orange zest, salt, and cinnamon until creamy. Add yogurt and egg and beat to combine. Add oat mixture and beat to combine. Fold in dates, banana chips, chocolate chips, and walnuts. Mound dough in 1/4-cup scoops on prepared baking sheets. Flatten slightly to yield a bigger, flatter cookie as the dough will not spread much. Bake until golden, about 18 minutes. Allow cookies to cool on baking sheets for 10 minutes, then transfer to wire racks to cool completely. 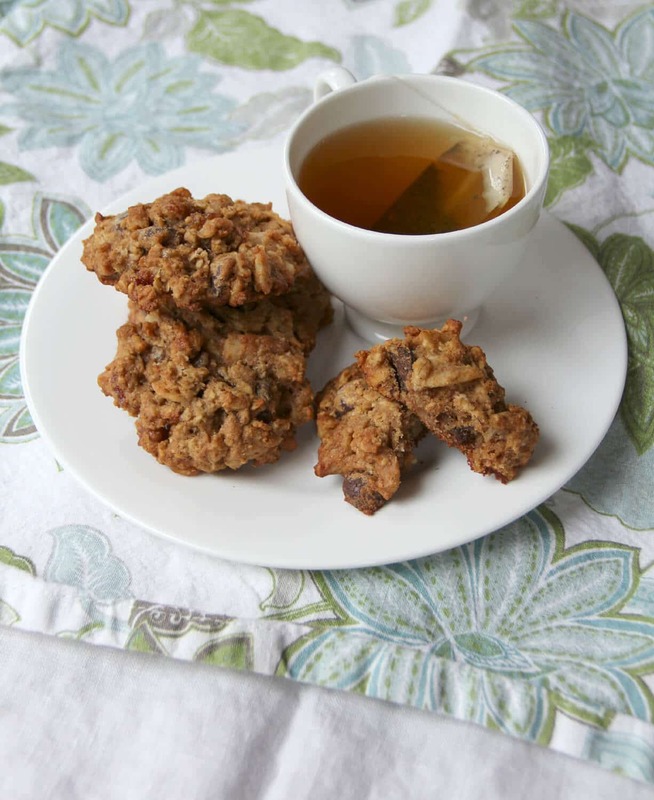 Recipe adapted from Breakfast Cookies in Oprah magazine.